In the middle of apple and pumpkin season, let’s not forget about a large group of people … Peanut Butter and Chocolate Lovers! I tend to get focused on fall flavors and then my family reminds me about the peanut butter and chocolate. There is a possibility that my house may be the national headquarters for peanut butter and chocolate lovers! After all … I’m married to The Peanut Butter Man! Cut Nutter Butter Cookies in half. I used a serrated steak knife and sawing motion. Melt the chocolate and place in a squeeze bottle (or just use a toothpick). I use the chocolate as “edible glue” (not like the paste you ate in Kindergarten!) to hold all the parts together. 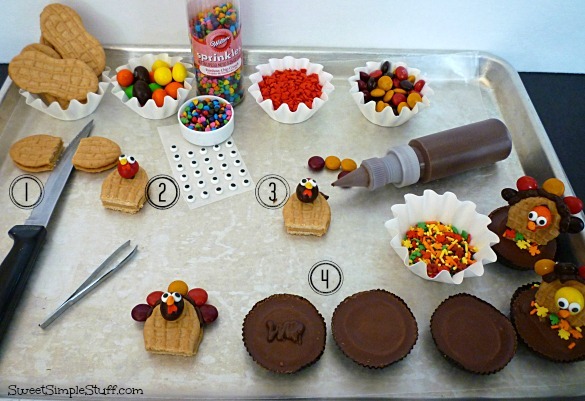 Use a dot of chocolate to attach a Peanut M&M (head) to the cookie, then the red heart (waddle), Rainbow Chip (beak) and candy eyeballs. 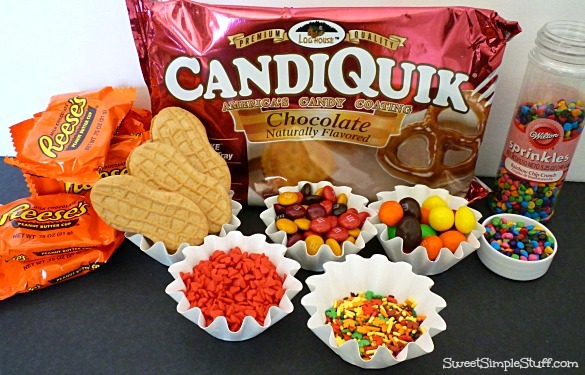 Make a larger squiggle or dollop of chocolate on a peanut butter cup, attach turkey and add sprinkles … let chocolate harden up and tap off any extra sprinkles. I have a family story to share that has nothing to do with turkeys … First, let me say that I am 58 years old … Son #3 is 29 years old … a few days ago I went to the doctor … came home and told Son #3 that the doctor confirmed what I had thought … I have Shingles … Son #3 looked at me and said “I thought that only old people got Shingles!” … I broke the news to him … “I’m old!” … the hubby and I are surprised (and happy) that he doesn’t think of us as old, LOL 😉 I know that my kids keep getting older … somehow I don’t think that I’m getting older! Cute. 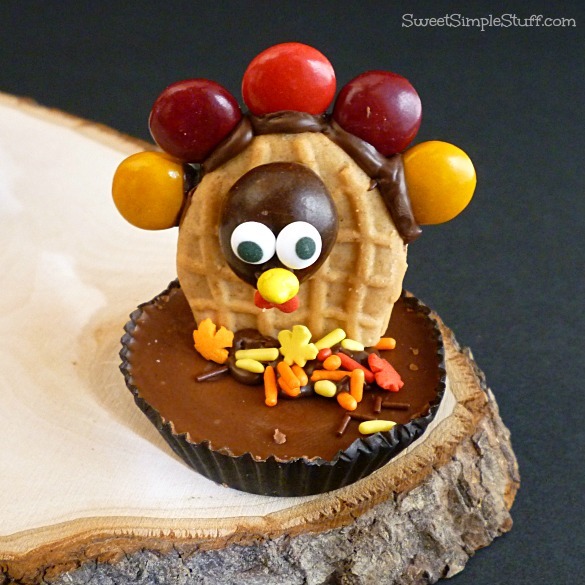 Your turkeys are a unique twist on the cookie/candy decorations you usually see. I like it! 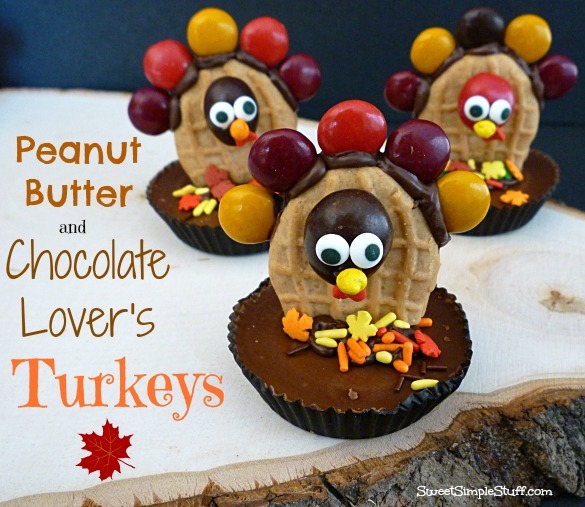 These turkeys are soooo cute and have to taste great because they are peanut butter and chocolate (our family favorites). Yum, Yum. So unique – compared with all the others on the net. This will be a Reese lovers delight! Thanks for the tip on attaching the M&M feathers. It’s great that you post what works and what doesn’t work so we’re sure our project will succeed. What in the world would we do without Nutter Butter bars? Thank you Tavette 😉 You are welcome for the tip … the world sure is better with Nutter Butters! Oh, how very clever. These are Adorable and look so much better than the ones I had seen on the net. Oh, yes, nothing goes better with a Nutter Butter than a peanut butter cup along with M&M’s. OMG, I thought you were going to say you were expecting… something (he-he). Tell PB man or your son that I think a good Xmas gift for you would be a sign: Caution. Genius at Work! 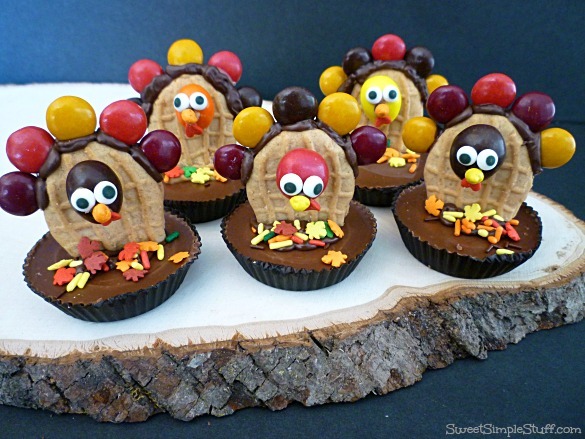 These turkeys are too cute! Pinned! Your Nutter Butter Recipes are awesome. Thank you Anna 🙂 Nutter Butters are awesome!